Four grown kids (and their wonderful partners), six delightful grandchildren, constant, long-time partner. A retired academic, I've recently moved with my husband from a waterfront home on a very small (Canadian) West Coast island to a condo in the city (Vancouver). Still reading compulsively, though, and keen to discover what new priorities emerge, what interests persist in this urban life after 60! Okay, so far I'm liking the greater immediacy and ease of posting the books I'm reading on Instagram. I don't feel as compelled (or constrained!) to wait until I've got a few decently structured paragraphs as I tend to do in this blog format. This means less guilt or sense of unmet obligation, which is good from my perspective at least. I do miss the conversations we've had here -- I hope some might develop on Instagram, but I think that the blog might be a cosier place to nourish and sustain those, so I'm going to try to keep this space working although I may tend to fill it with photos and/or point you over to photos I've already posted on Instagram. I hope I'll find a workable balance/solution gradually, and I also hope you will hang in there while I do. 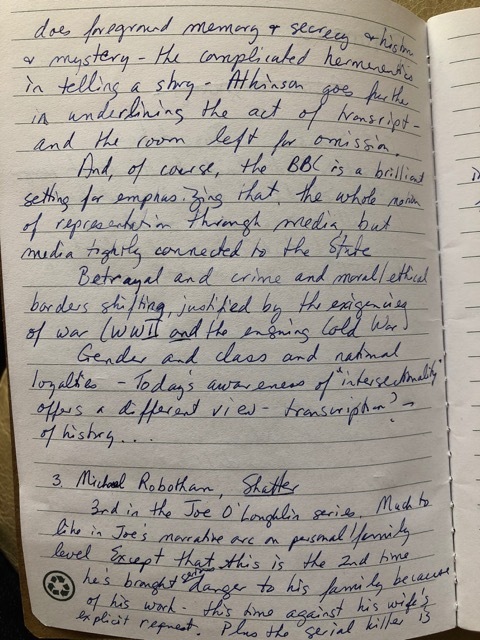 Besides trying out the new Instagram account (devoted just to my reading), I'm also experimenting with keeping a little notebook of books read, sometimes jotting down a few thoughts, mostly to jog my memory about what I've read. I'm going to share these pages with you from time to time via photos. 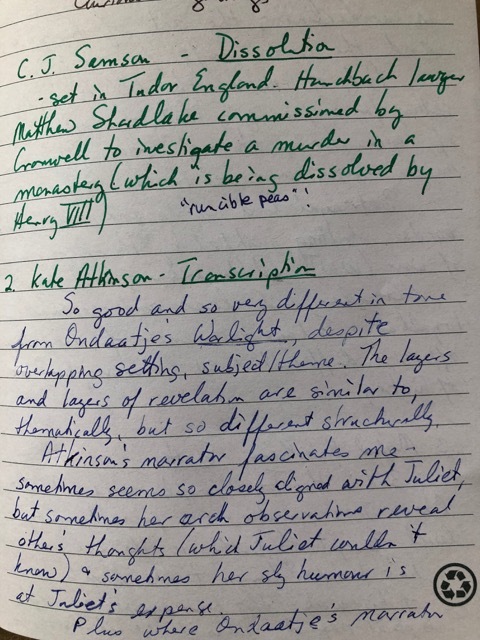 Right now, I think I won't offer transcriptions of my handwritten text -- that would defeat my purpose which is to spend a bit less time keyboarding and online. But I will be happy to "translate" particular passages or words you can't make out. . . The notebook pages for books I've read so far this year. . .
and about Transcription here and here and here (If you've been following my reading account on Instagram, you'll already have seen these. . .
You know I love to hear from you, whether in the Comments here or over on Instagram. I'm curious to know if you've read any of these books -- and if so, how do our responses compare? what did you like that I didn't and vice versa? -- but also always curious about what you're reading. I think that the latter, especially, makes the conversations here a good resource for the readers who visit from time to time. Over to you. . . Thanks for the recommendation -- as you can tell, I enjoyed Dissolution, and I will probably go on to read the rest of the series. 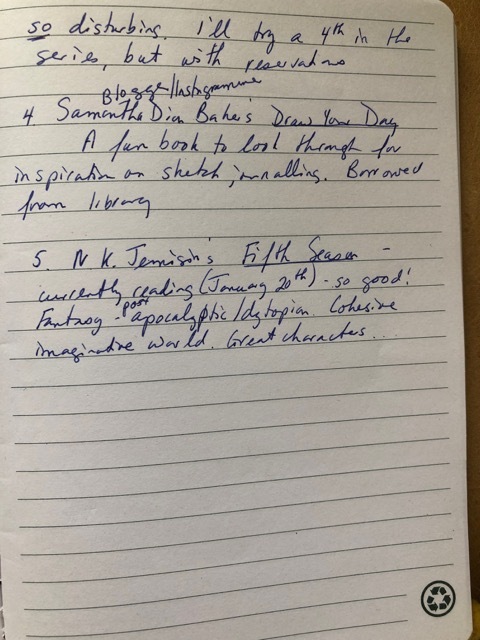 I've made a note of Naomi Norvik -- Jemisin's is quite a different kind of Fantasy, perhaps better thought of as Science Fiction or Speculative Fiction. Looking forward to finding out about your Croatian author! I have Transcription on request at the library (spies!) along with some travel mood-setting: Mapp and Lucia (Rye will home base for some ancestor hunting) and some Ann Cleeves (ditto Northumberland). I'll add Warlight to the list. I had to look back to see what I have read in the last months but there's not much worth reporting. The Christmas Chronicles. Very comforting and seasonal. I hadn't heard about the Mapp and Lucia novels (nor the TV series). Reading to set the mood for travel is always fun. I'll wait to hear what you might think of Warlight -- I loved it and will reread. . .
1. Elizabeth George: The Punishment She Deserves. I love fat books, and I spent a long, dark weekend immersed in this one. Not every detail convinced me, but I had such a good time. 2. Bruno Bettelheim, The Uses of Enchantment. A Classic which had escaped me until now. While I can follow Bettelheim's basic assumptions, I found his writing repetitive and erratic at the same time. So I think I'll return the book to the library without finishing it completely. 3. A book of essays by a German historian (specializing in Italian Renaisasance)about historical Italian landscapes on the basis of written documents, archeological findings, and paintings of various epochs. A wonderful combination of history of everyday life and the challenges of historical research methods. Thanks for this, Eleonore. I love fat books as well, especially well-written mysteries on a long dark weekend. And I'm a big fan of Havers and Linley. . . I've never read any Bettelheim, to be honest, although I'm vaguely aware of his focus. I like that you gave yourself permission not to return the book after first giving it a fair shot. And that book of essays sounds fascinating -- I'm assuming it's the same one you mentioned earlier with reference to Fiumicino. . . Yes, it is (the same book, and fascinating). There is no translation to English or French, I am sorry to say. I've just finished reading "Women Talking" and I certainly did enjoy it, though perhaps enjoy is not quite the right word for such a difficult topic. The characters were very strong and their voices lingered in my head long after I finished the book. I'm anxious to read the new Kate Atkinson, one of my favourite authors.That will be next on my list. mater at a BIG library! Trying my best to age contentedly, if not enthusiastically. I taught piano and music theory (history, harmony, etc.) while my four children were young and then completed my BA once my youngest was in school. Then my MA, then my PhD (in Canadian Literature) and taught happily at a small university from which I'm recently retired. All made possible by a supportive husband. We've just moved from a small West Coast island to an urban condo (Vancouver, BC). Three daughters, a son, their partners, and five delightful wee grandchildren. Life's full! Now what did I say . . . ?